I feel like I’ve been working on this non-stop. But for good reason – I’m making progress. Just take a look. I’ve been able to add an entire branch with the names Crotts, Worley and Howard! Phew! It doesn’t seem like a lot but this took over a month. In this tree you’ll see there is Samuel Johnston and Sarah Bell. I’ve already explained how I made the connection to them in this post. They had a daughter Emma Johnston who married William Blackwell. This was where I took a leap of sorts. I explained that here.. So how did I figure out the next generation? It was hidden away in one of my DNA cousins family tree. Let me explain..
Henry H Blackwell showed up on two census records with his parents, William and Emma – 1870 and 1880. If you do any kind of genealogical research, you might know that almost zero 1890 census records are out there – so nothing there. I had already researched the other children of William and Emma and nothing really stood out so what happened to Henry? Here you see Henry Blackwell born in Nov 1864 in Alabama. His parents were born in Alabama – I have no idea why Henry moved to Tennessee but he did. And in this census record he was married to Alice and has 5 children. 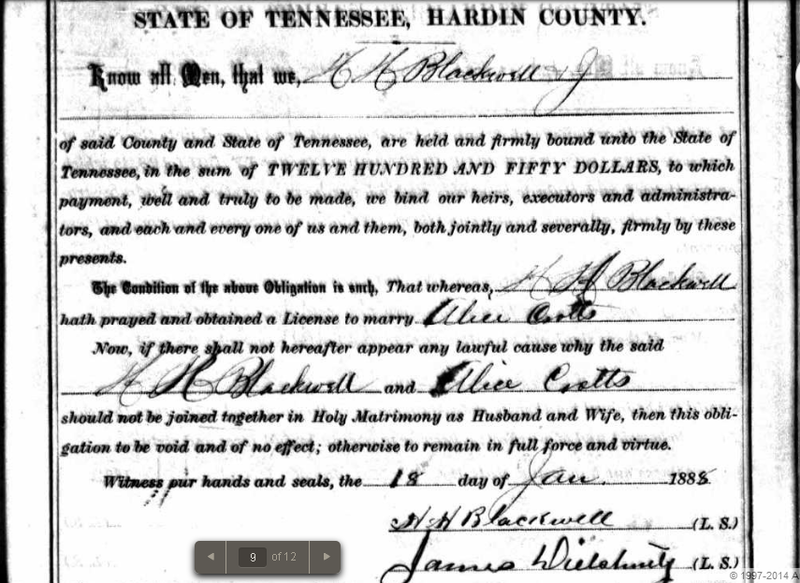 I found a marriage record for the couple – but Alice’s name was transcribed as Alice Gotts… If you look at the image, you can see how someone would make the mistake but it is definitely Crotts. So now I had to do some research on Alice Crotts and figure out where she came from. If I have DNA cousins that share some common ancestors of hers, I know I’m on the right track. Here’s the problem. I can not find a single record linking her to any parents. According to the 1900 census, she was born around 1873 and the 1910 census says 1871 so she should show up in an 1880 census but I get nowhere. Nothing. So I do my last ditch effort and click on the family tree hints – I really try not to do this unless I’m totally stuck because lots of people will just throw some things together even if it’s totally bogus. Check your sources please! Anyways, I find my mom’s 3rd cousin match and his tree. He didn’t have this tree linked to his DNA results – so all this was new to me. He has Henry H Blackwell married to a person by the name of Louisa Crotts. Same last name… I click on his tree and look at this records. He has the same exact records as me (the one’s where her name is listed as Alice) 1900 and 1910 census record but no 1880 but he had parents listed out too. Next step – link my mom’s DNA results to one of the kids of Henry and Alice (Louisa) Crotts… And wait. I didn’t have to wait long. That little shared ancestor leaf hint brought up multiple matches! Yeehaw! 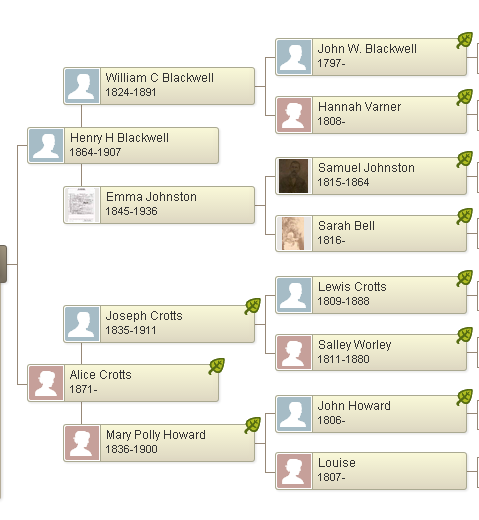 I think I got 3 or 4 cousins that share Sally Worley and Lewis Crotts as ancestors. What does this tell me? There is some validity to this guys assumption of Alice’s parents. But I’m not done yet – Now I have to find info on Henry and Alice’s children. Alice was asked how many children she had and she answered 6 and she was also asked how many are still alive and she answered 4. This leads me to believe that Willie and Mary K died between 1900 and 1910. So, now I just have to repeat the process and find which of these four children my mom is directly related to.